Monday: We enjoyed Mary Connealy's rant today as she talked about the whole Tortoise and the Hare thing! Are you a Tortoise or a Hare? Tuesday: Courtney Walsh dropped by with a reminder of 5 things to let go today! The winner of Just Let Go, Courtney's latest release is Stephanie Gammon. Wednesday: Mindy chatted with Jill Kemerer about friendship and Jill's latest release, Reunited with the Bull Rider. And the winner of Reunited with the Bull Rider is Wilani Wahl! Friday: Annie keyed in on one aspect of supporting authors, but warning of counterfeit books! The winner of a pack of books is Linda Orr! Monday: Today, Missy Tippens will be posting! Let's talk about what to do when your critique partner writes R.U.E. on your pages (a note Missy has often seen!). Wednesday: Ruth Logan Herne is in the house talking about the stories around us and how one central fact can be spun in multiple ways. Trust her, no two stories are the same, and smile with her as she re-releases "The First Gift" her beautiful story of one little girl's life and her effect on so many around her. A copy of a Ruthy book will go to one lucky person posting a comment! Friday: Winnie Griggs will be talking about the role Perspective plays in fiction - when looking through the character, writer, and reader lens. 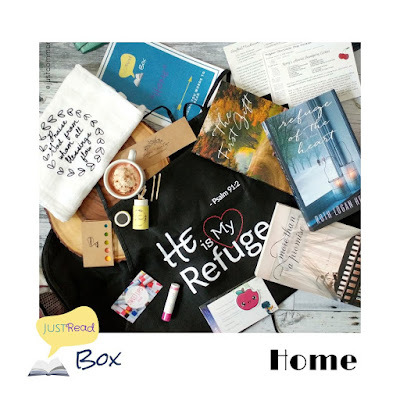 And for this Weekend Edition, Ruthy is offering a Kindle copy of either "Refuge of the Heart", "More Than a Promise" or "The First Gift" to one person commenting... but tell her you want to be entered! All are welcome! Did you see the celebration happening for the release of The Road to Magnolia Glen by Pam Hillman on Instagram and Facebook? Don't miss it for a chance to win quite an awesome prize from Pam! We're also celebrating the re-release of Ruth Logan Herne's The First Gift! Come check it out, starting June 11th for the Takeover Tour and June 12th through 16th for the Bookstagram Review Tour! FIRST SALE NEWS!! Seeker villager Cindy Regnier made the exciting announcement that she has signed a contract with Lighthouse Publishing of the Carolinas!! Cindy, we're thrilled for you and can't wait for your June 2019 release! In inaugural JustRead Book Box featured 3 of Ruth Logan Herne titles, and all signed! (Must be tiring, Ruthy! Thank you!) We have a few boxes left in our Etsy shop, ready to ship! Writing Your Character's Inner World by Linda Clare. 4 Ways to Write a Better Antagonist by K.M. Weiland at Helping Writers Become Authors. 5 Ways Repetition Is Hurting Your Novel by Janice Hardy at Fiction University. 9 Top Book Marketing Takeaway from BookExpo 2018 at the BookBub Partners blog. Annie and Carrie I love, love, love those book boxes! What a great idea!!!! You guys are the most clever booksters I know! Thank you for all of your help in getting these titles out into reader and reviewer hands... I am so grateful! And what a fun week we've got coming up... Happy dancing for winners and heading off to work which means tucking myself in a quiet 4:00 AM spot and writing before the world finds me! Good morning, Seekerville!!!! Good morning to you too Ruthy! You're probably out writing now. I woke up way to early for this girl that reads past her bedtime. I'm glad you love the boxes! Ruthy, I'm a night owl, and prefer to never see 4 am! But I may have to try your early rising to get some quiet time. I'll let you know if I try it! Congratulations winners! Have a blessed weekend, everyone! Mindy, I'm tucking you in! And I'm glad you have the others, sweet thing! What a fun week this has been and next week looks like it’ll be a great one, too. So many wonderful posts. Congrats to all the winners and congrats once again to Cindy Regnier on her first sale. Woot, woot! Hope everyone has a great weekend. Happy weekend! Congratulations to all the winners! Cindy, congratulations again on your book! Such exciting news! Would love to be entered in Ruthy's drawing. Those book boxes are an awesome idea. We had a conference at church once where they asked members to sign up to create gift baskets that would then be given away during the conference. I went in with another family and we did a writing/reading basket. She put in notepads, pens, etc. and I put in a few of my favorite authors' books that I had finished reading. It was so much fun! That's a great idea, Sally! Sally, you're in! And what a great idea for the baskets. Beth and I do that for local things, too... and it's just a fun way to get word out and be part of our larger local community. Community is where it all begins, doesn't it? Congratulations Cindy. I am so thrilled for you. I am visiting my dad for the weekend. It's a bitter sweet time. WevWe had some fun reminiscing, but so hard to see him failing. While he sleeps i read my kindle. Blessings on you and your dad, Wilani. I know how painful that can be. Oh, Wilani, we understand so well. :( God bless you. You're a good daughter, Wilani! Congratulations to both the winners of book drawings and the authors who have new books being published. I am always eager to read Ruthy's books so please enter my name in her drawing. Connie, I'm tucking you in right now! Congratulations, Cindy! I'm so happy for you! It’s been a wonderful week in Seekerville with even more to come next week! Congratulations again, Cindy - I can’t wait to read your book! And please put my name in the drawing. �� my TBR is down to three books - GASP! Have a blessed weekend everyone! Laurie, I'm tucking you in! And I love the TBR pile reduction, LOL! Go you! Thanks everyone for your good wishes and thanks to Missy for posting it in Seekerville! Who wouldn't want a Ruthy book? Put me in for The First Gift, please. Cindy, we're so thrilled for you!! How did you celebrate signing that contract? YAY, CINDY! Congratulations on that first sale!! Cindy, I'm tucking you in! And I'm so happy for you! I just sent out copies of "Her Cowboy Reunion" and I believe my first note to you was CONGRATULATIONS!!! :) Go you! Great WE! Seekerville is coming and going and sliding sideways in every direction. There's something for everyone here today! :) Happy weekend, all! Like a great pot of stew or maybe an antipasto salad! This is my first post with a Chromebook. Trying to learn something new. Happy Weekend, I hope this works. Enjoy your weekend, and stay safe! Oh, Patti, I love christenings! I love those sweet babies! Enjoy this very special time, my friend! and she is so stinkin' cute! How special, Patti Jo. Blessings to your sweet little one on this important day! Hugs to you and your family! Congrats winners, and Cindy!! What a fun week. And no need to enter me. I already own, have read, and LOVE all three books. Just had to throw that out there. I love Ruthy. That's all. LOL. Ok... enough procrastinating and back to writing. Oh, you sweet thing! THANK YOU! I can't wait to head west and buy ice cream at your shop.... and someday soon to buy my own copy of a Megan Brummer book! We've had an awesome, wild and crazy weekend. We had almost all of our children and grandchildren here to celebrate our 50th wedding anniversary! We're so blessed to have them live close enough to visit often. I'd love to be entered to win a Ruthy book! Throw my name in that farmer hat! You are in the farmer hat, Winnie!!! :) And what a celebration, dear lady. FIFTY YEARS!!!!! oh, that is a reason to celebrate and kick up our heels right there! God bless you both! Happy Anniversary, Winnie. How wonderful on 50 years. Congrats, Cindy!!! So thrilled for you! Woot!!! Congrats to all the winners! I hope everyone is enjoying summer! Love the fresh fruit and vegetables!!! And the sunshine and blue skies. Happy Weekend, everyone. Hope everyone is enjoying. I haven't felt the best so have been kind of lazy. Please put me in the drawing for Ruthy's More than a Promise. I already have the other two! Congratulations, Cindy, on your upcoming book. That is great news. Sending prayers for healing, Sandy! Congratulations to all you winners! Looking forward to the coming week on Seekerville. Happy weekend everyone.